The need to empower Nigerian women, especially in the area of technical know-how for solar lanterns and mobile phone chargers as shown by Solar Jooce and partners, is an encouraging initiative that deserves commendation and support, writes REMMY NWEKE. When you educate a woman, you educate a nation,” those were probably the words of the elders, which have continued to be relevant now and in the future. 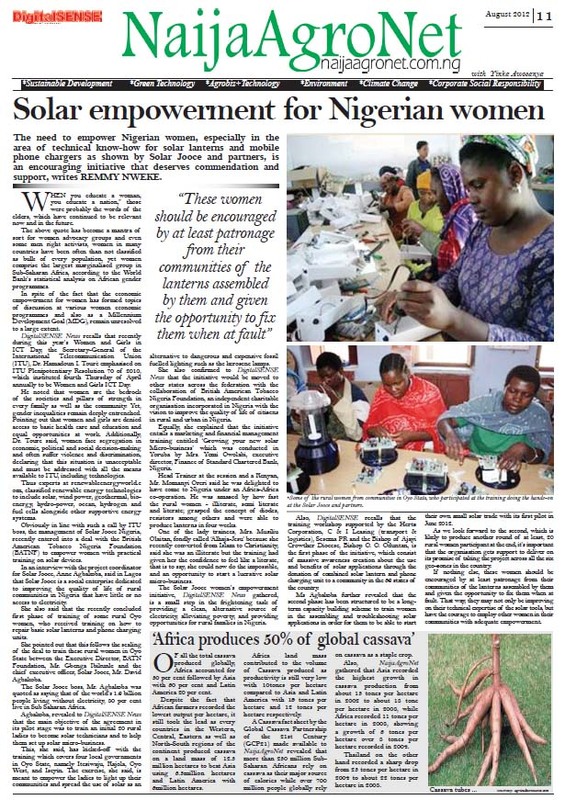 The above quote has become a mantra of sort for women advocacy groups and even some men right activists, women in many countries have been often than not classified as bulk of every population, yet women comprise the largest marginalized group in Sub-Saharan Africa, according to the World Bank’s statistical analysis on African gender programmes. In spite of the fact that the economic empowerment for women has formed topics of discussion at various women economic programmes and also as a Millennium Development Goal (MDG), remain unresolved to a large extent. DigitalSENSE News recalls that recently during this year’s Women and Girls in ICT Day, the Secretary-General of the International Telecommunication Union (ITU), Dr. Hamadoun I. Touré emphasized on ITU Plenipotentiary Resolution 70 of 2010, which instituted fourth Thursday of April annually to be Women and Girls ICT Day. He noted that women are the bedrock of the societies and pillars of strength in every family as well as the community. Yet, gender inequalities remain deeply entrenched. Pointing out that women and girls are denied access to basic health care and education and equal opportunities at work. Additionally, Dr. Toure said, women face segregation in economic, political and social decision-making and often suffer violence and discrimination, declaring that this situation is unacceptable and must be addressed with all the means available to ITU, including technologies. Thus experts at renewableenergyworld.com, classified renewable energy technologies to include solar, wind power, geothermal, bio-energy, hydro-power, ocean, hydrogen and fuel cells alongside other supportive energy systems. Obviously in line with such a call by ITU boss, the management of Solar Jooce Nigeria, recently entered into a deal with the British American Tobacco Nigeria Foundation (BATNF) to empower women with practical training on solar devices. In an interview with the project coordinator for Solar Jooce, Anne Agbakoba, said in Lagos that Solar Jooce is a social enterprise dedicated to improving the quality of life of rural communities in Nigeria that have little or no access to electricity. She also said that the recently concluded first phase of training of some rural Oyo women, who received training on how to repair basic solar lanterns and phone charging units. She pointed out that this follows the sealing of the deal to train these rural women in Oyo State between the Executive Director, BATN Foundation, Mr. Gbenga Ibikunle and the chief executive officer, Solar Jooce, Mr. David Agbakoba. The Solar Jooce boss, Mr. Agbakoba was quoted as saying that of the world’s 1.6 billion people living without electricity, 80 per cent live in Sub Saharan Africa. Agbakoba, revealed to DigitalSENSE News that the main objective of the agreement in its pilot stage was to train an initial 20 rural ladies to become solar technicians and to help them set up solar micro-business. This, she said, has kicked-off with the training which covers four local governments in Oyo State, namely Itesiwaju, Kajola, Oyo West, and Iseyin. The exercise, she said, is meant to empower the ladies to light up their communities and spread the use of solar as an alternative to dangerous and expensive fossil fuelled lighting such as the kerosene lamps. She also confirmed to DigitalSENSE News that the initiative would be moved to other states across the federation with the collaboration of British American Tobacco Nigeria Foundation, an independent charitable organization incorporated in Nigeria with the vision to improve the quality of life of citizens in rural and urban in Nigeria. Equally, she explained that the initiative entails a marketing and financial management training entitled ‘Growing your new solar Micro-business’ which was conducted in Yoruba by Mrs. Yemi Owolabi, executive director, Finance of Standard Chartered Bank, Nigeria. Head Trainer at the session and a Kenyan, Mr. Momanyi Oreri said he was delighted to have come to Nigeria under an Africa-Africa co-operation. He was amazed by how fast the rural women - illiterate, semi literate and literate; grasped the concept of diodes, resistors among others and were able to produce lanterns in four weeks. One of the lady trainees, Mrs. Musiliu Olaitan, fondly called ‘Alhaja-Jesu’ because she recently converted from Islam to Christianity, said she was an illiterate but the training had given her the confidence to feel like a literate, that is to say, she could now do the impossible, and an opportunity to start a lucrative solar micro-business. The Solar Jooce women’s empowerment initiative, DigitalSENSE News gathered, is a small step in the frightening task of providing a clean, alternative source of electricity, alleviating poverty, and providing opportunities for rural families in Nigeria. Also, DigitalSENSE News recalls that the training workshop supported by the Hertz Corporation, C & I Leasing (transport & logistics), Sesema PR and the Bishop of Ajayi Crowther Diocese, Bishop O. O. Oduntan, is the first phase of the initiative, which consist of massive awareness creation about the use and benefits of solar applications through the donation of combined solar lantern and phone charging unit to a community in the 36 states of the country. Ms Agbakoba further revealed that the second phase has been structured to be a long-term capacity building scheme to train women in the assembling and troubleshooting solar applications in order for them to be able to start their own small solar trade with its first pilot in June 2012. As we look forward to the second, which is likely to produce another round of at least, 20 rural women participant at the end, it’s important that the organization gets support to deliver on its promise of taking the project across all the six geo-zones in the country. If nothing else, these women should be encouraged by at least patronage from their communities of the lanterns assembled by them and given the opportunity to fix them when at fault. That way, they may not only be improving on their technical expertise of the solar tools, but have the courage to employ other women in their communities with adequate empowerment.